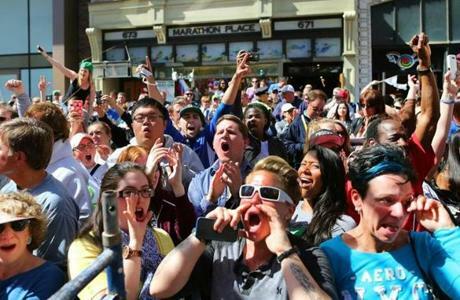 A woman wiped a tear as the crowd cheered at the site of last year's first bombing on Boylston Street after a moment of silence at 2:49pm. 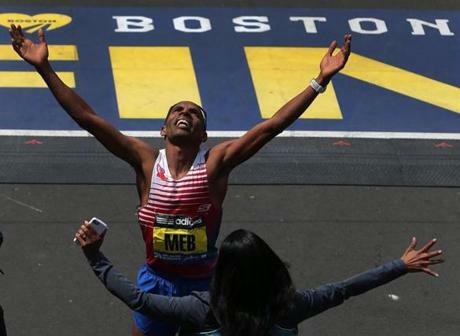 Meb Keflezighi crossed the finish line to become the first American winner of the men's race since 1983. 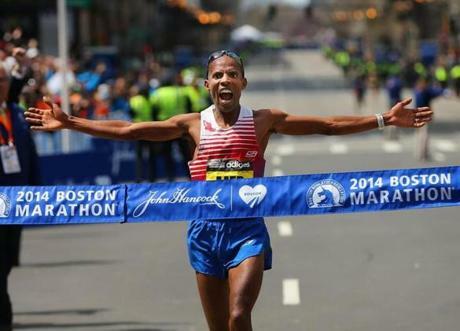 Keflezighi was ecstatic at the finish line. 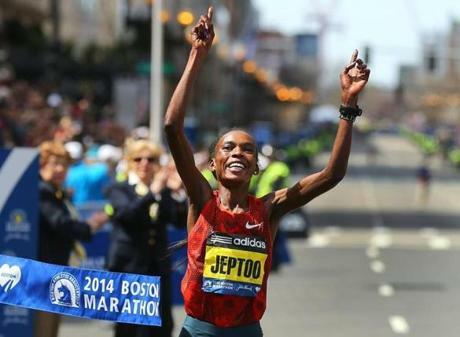 Women's winner Rita Jeptoo crossed the finish line. 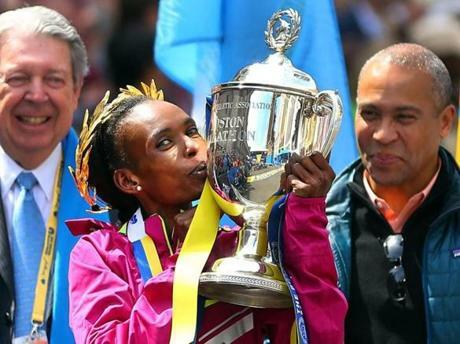 Jeptoo gave some love to her trophy. 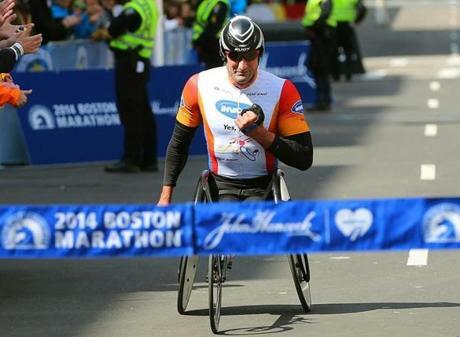 Ernst Van Dyk, of South Africa, crossed the finish line to win the men's wheelchair division. 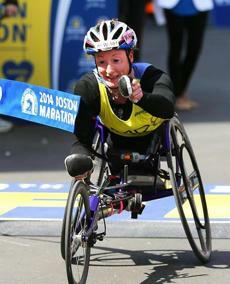 Women's wheelchair winner Tatyana Mcfadden crossed the finish line. 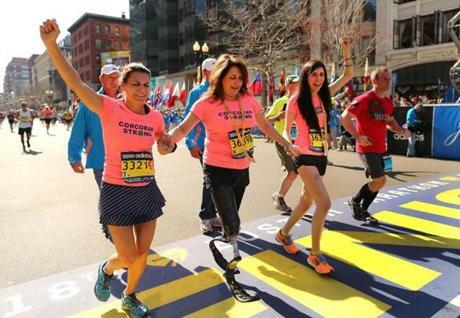 Bombing survivors Celeste Corcoran (center) and Sydney Corcoran (right) crossed the finish line with Celeste's sister, Carmen Acabbo. 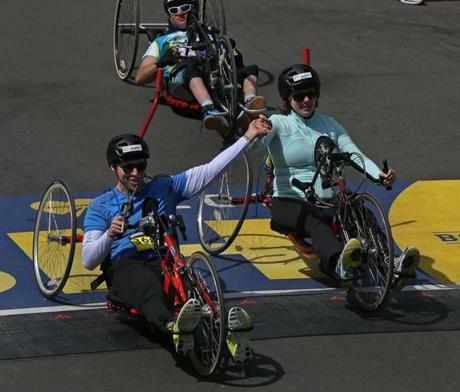 Bombing survivors Patrick Downes and Jessica Kensky crossed the finish line. 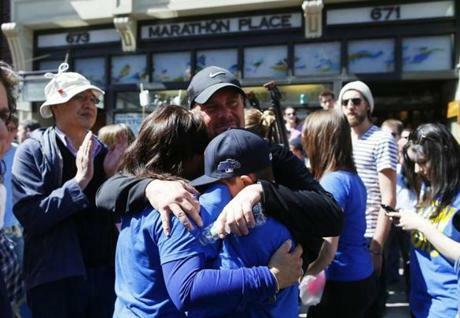 Paul Strong of Wakefield embraced his wife, Shannon, and son, Colin, during a moment of silence at 2:49 in front of Marathon Sports. 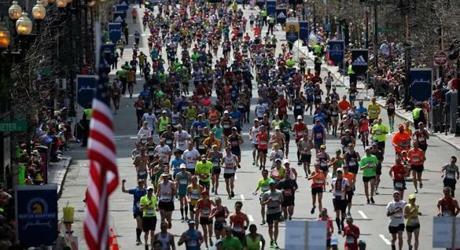 There were lots of exhausted runners at the finish line. 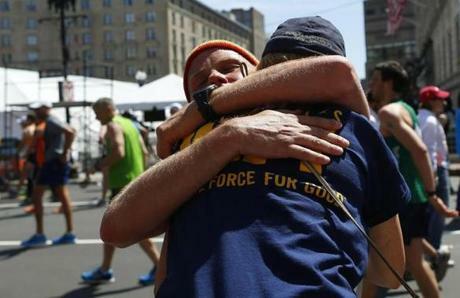 Elliott Layton, 33, of Indianapolis, hugged his mother, Linda, after he crossed the finish line. 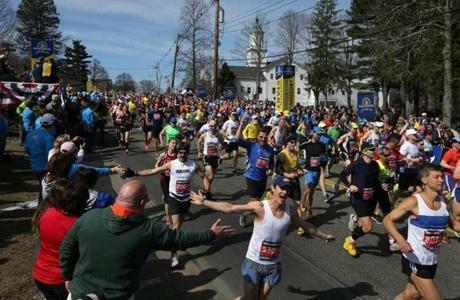 The scene at the start of the Boston Marathon in Hopkinton. 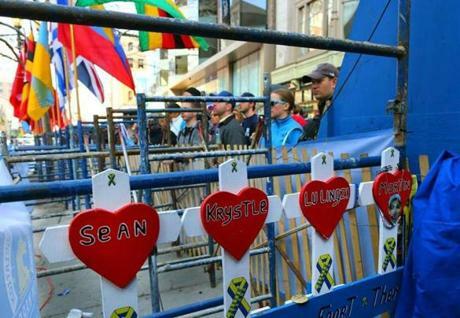 Spectators stood at the site of the first bomb on Boylston Street as a small memorial sign for the victims of the 2013 bombings was tucked away. 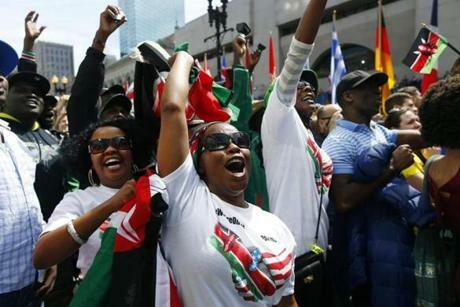 (From left to right) Hannah Kiongo, of Peabody, Eunice Waweru, of Springfield, and Jane Wanja cheered on Jeptoo as she came down Boylston Street. A long line of runners approached the finish line. 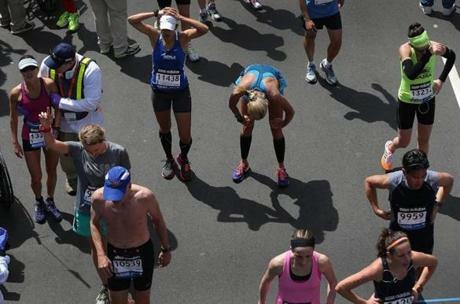 Josephine Bouquet, 22, of Maryland, wiped a tear away as she stood beside her mother, Yun, at the finish line before the start of the race. 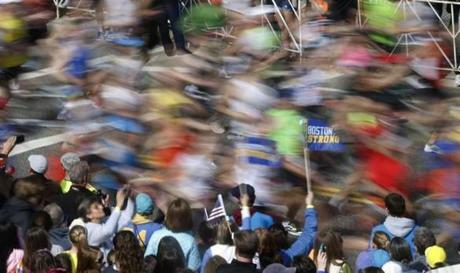 Josephine ran the Marathon last year, but was stopped about a mile from the finish when the bombs went off. 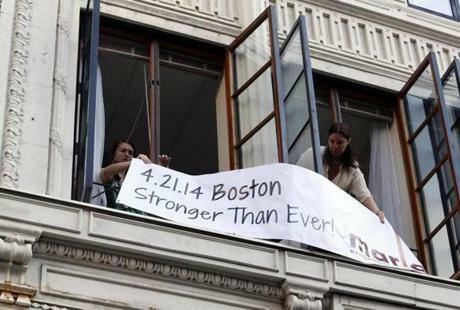 Two women displayed a sign from a window above the site where the first bomb went off last year at the finish line. 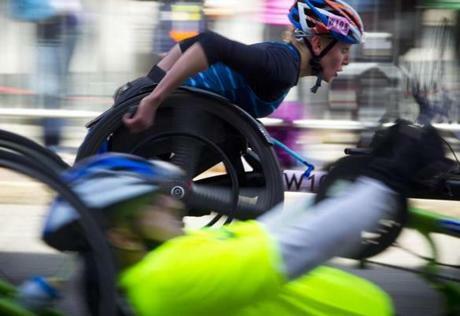 Susannah Scaroni raced down Boylston Street for a third-place finish. 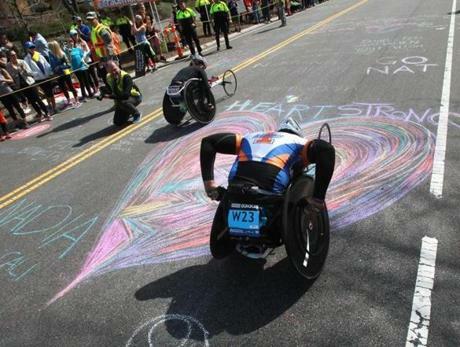 Wheelchair racers passed a giant chalk heart as they climbed Heartbreak Hill in Newton. Runners arrived to cheering crowds in Wellesley. 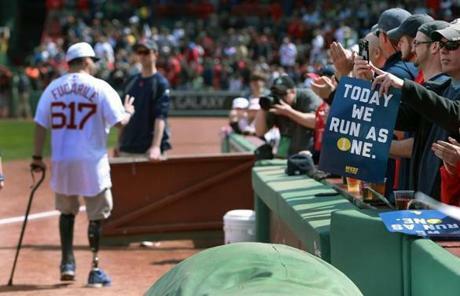 Bombing survivor Marc Fucarile, of Stoneham, threw out the ceremonial first pitch before the Red Sox game Monday. 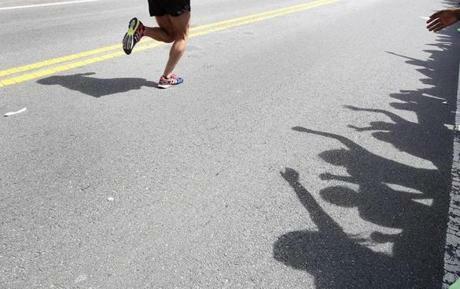 The shadow of the crowd in Wellesley was outlined on the street. 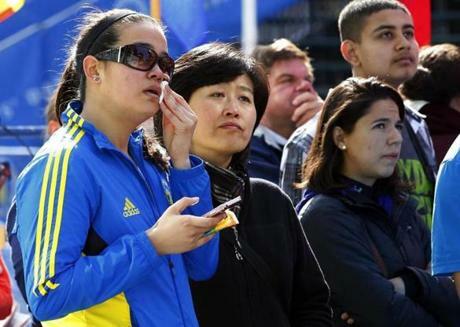 Boston Marathon runners were cheered in downtown Framingham. 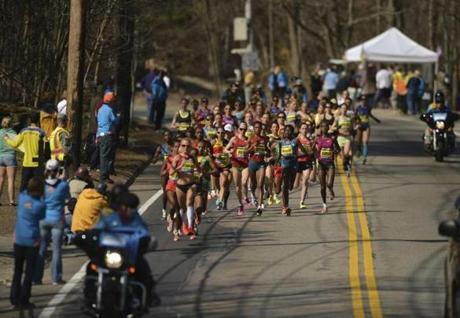 The women's elite runners were packed together in Hopkinton. Wellesley College students Antoinette Garcia ( left) and Taylor Pastuer held signs for the runners. 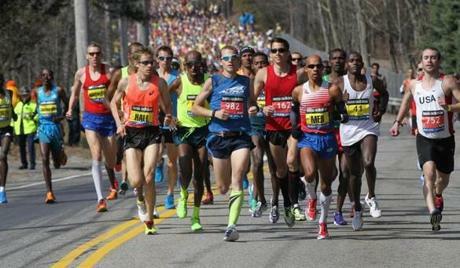 The elite men approached the first mile marker in Hopkinton. 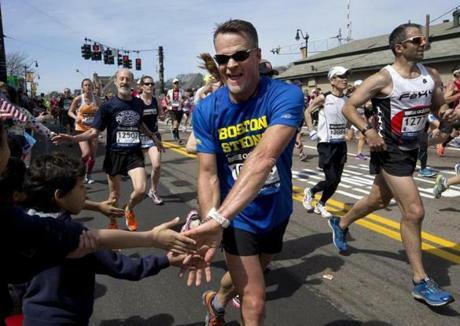 Jubilant runners received high fives at the start of the race. Meghan Dunn relaxed with other charity runners for Children's Hospital before the start of the Boston Marathon at the Masonic Lodge in Hopkinton. 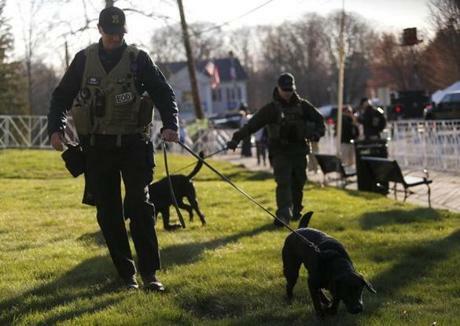 Bomb-sniffing dogs with various law enforcement agencies patrolled near the starting line. 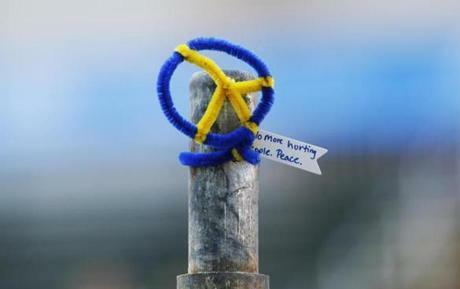 A peace sign topped one of the barricades near where the first bomb went off at the Boston Marathon last year.